Stakeholders have to face requirements in increasing number and complexity, and the link between these requirements and design artifacts is primordial. Agile design methods and documentation techniques have emerged in the past years in order to trace the decision process and the rationale sustaining a software model. The present work proposes an integrated framework combining system requirement definitions, component-based models and model transformations. 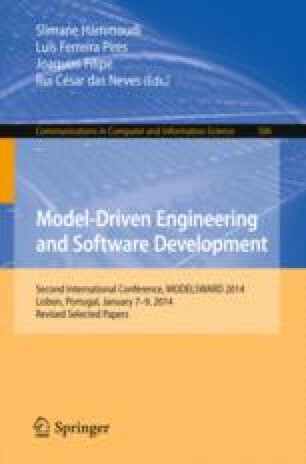 Architecturally significant requirements are explicitly linked to software architecture elements and iteratively refined or implemented by model transformations. Any transformation must be documented, even briefly, and the framework retains the transformations tree. This way, the iterative decision and design processes are completely documented for future reference or modification, i.e., designers can (i) see the mapping between a system requirement and its implementation in the architecture model, (ii) explore design alternatives or apply structural modifications without losing previous versions of the model, and finally (iii) at least understand partially the reasons why the model is how it is. This paper is an updated version of A DSL for Stepwise Design of SA .